cheer to the Hills, writes VANESSA MASSEY. Watching the amazing transformation of young performers as they develop is something Roxanne and Stephen Kiely have devoted their lives to. 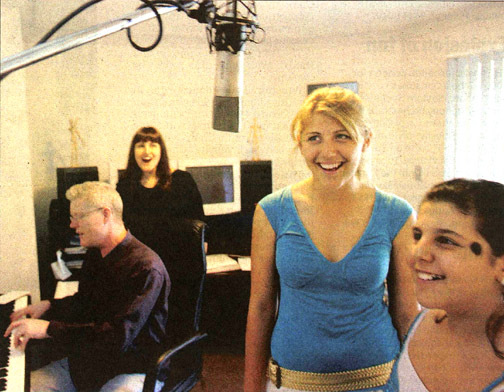 Owners of ScoopFX Music Tutiton in castle Hill, the couple found success in singing and in their own musical careers. They are also great believers in passing on their knowledge about the cut-throat entertainment industry to future stars as well. A vocalist coach for 15 years, Roxanne has been a major player in Delta Goodrem's career, teaching the singing sensation since she was nine years old. "It has been unbelieveable to watch this young girl grow from a very talented student into a professional singer who has achieved such world-wide success." Roxanne said. She was even on hand to help Delta warm up during her Australian tour and has become a lifelong friend of the Goodrem family. Other well-known students of hers include Sarah Blasko, Adam Saunders, Bec Cartwright and Rogue Traders lead singer, Natalie Bassingthwaite. But being a singing sensation is not the only thing you can do in the entertainment industry - that's where Stephen comes in with his plethora of knowledge on musical instruments, especially the piano and guitar. "A lot of my students come to me because they want learn to play their instruments well and don't necessarily aim to be concert performers." Stephen said. Now the Kiely's are unleashing their latest students onto the Harvey Lowe Pavilion stage for a Christmas Concert next month. The lineup includes Eliza Milenkovic, who will sing On My Own and Jamila Zaiter, who has won many awards this year. The ScoopFX music students' Christmas concert will be held from noon to 5 pm on December 4 at the Harvey Lowe Pavilion.